Croxetti Coin Pasta is a Ligurian specialty with a dumpling-like quality. Croxetti coin pasta...hand stamped artisan pasta, on one side of this three dimensional coin pasta is the coat of arms where the pasta is made near Genova, the other side features a stalk of wheat. The dumpling-like quality makes Croxetti Coin Pasta ideal for any light, cream sauce. Coin pasta...simply turn a bowl of pasta into a gourmet experience. The detail on the Coin pasta forms ridges that allow sauces to "cling" to the pasta, adding more flavor. Coin pasta can be served with butter or extra virgin olive oil, with fresh herbs, or simply plain. Serve Coin pasta with a mushroom sauce, pesto or walnut sauce. 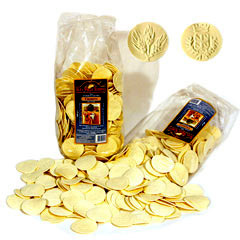 Croxetti Coin Pasta by Alta Valle Scrivia.